Europe scored a major space success with today’s (Feb. 13) flawless maiden launch of the brand new Vega rocket from Europe’s Spaceport in Kourou, French Guiana. The four stage Vega lifted off on the VV01 flight at 5:00 a.m. EST (10:00 GMT, 11:00 CET, 07:00 local time) from a new launch pad in South America, conducted a perfectly executed qualification flight and deployed 9 science satellites into Earth orbit. Vega is a small rocket launcher designed to loft science and Earth observation satellites. The payload consists of two Italian satellites – ASI’s LARES laser relativity satellite and the University of Bologna’s ALMASat-1 – as well as seven picosatellites provided by European universities: [email protected] (Italy), Goliat (Romania), MaSat-1 (Hungary), PW-Sat (Poland), Robusta (France), UniCubeSat GG (Italy) and Xatcobeo (Spain). Three of these cubesats were the first ever satellites to be built by Poland, Hungary and Romania. They were constructed by University students who were given a once in a lifetime opportunity by ESA to get practical experience and launch their satellites for free since this was Vega’s first flight. 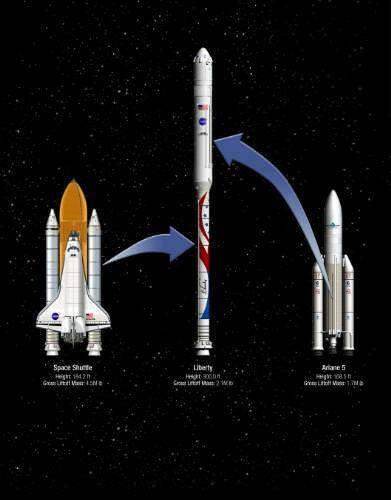 The 30 meter tall Vega has been been under development for 9 years by the European Space Agency (ESA) and its partners, the Italian Space Agency (ASI), French Space Agency (CNES). Seven Member States contributed to the program including Belgium, France, Italy, the Netherlands, Spain, Sweden and Switzerland as well as industry. ESA can now boast a family of three booster rockets that can service the full range of satellites from small to medium to heavy weight at their rapidly expanding South American Spaceport at the Guiana Space Center. Vega joins Europe’s stable of launchers including the venerable Ariane V heavy lifter rocket family and the newly inaugurated medium class Russian built Soyuz booster and provides ESA with an enormous commercial leap in the satellite launching arena. “In a little more than three months, Europe has increased the number of launchers it operates from one to three, widening significantly the range of launch services offered by the European operator Arianespace. There is not anymore one single European satellite which cannot be launched by a European launcher service,” said Jean-Jacques Dordain, Director General of ESA. Dordain noted that an additional 200 workers have been hired in Guiana to meet the needs of Europe’s burgeoning space programs. Whereas budget cutbacks are forcing NASA and its contractors to lay off tens of thousands of people as a result of fallout from the global economic recession. LARES, ALMASat-1 and CubeSats satellites integration for 1st Vega launch. 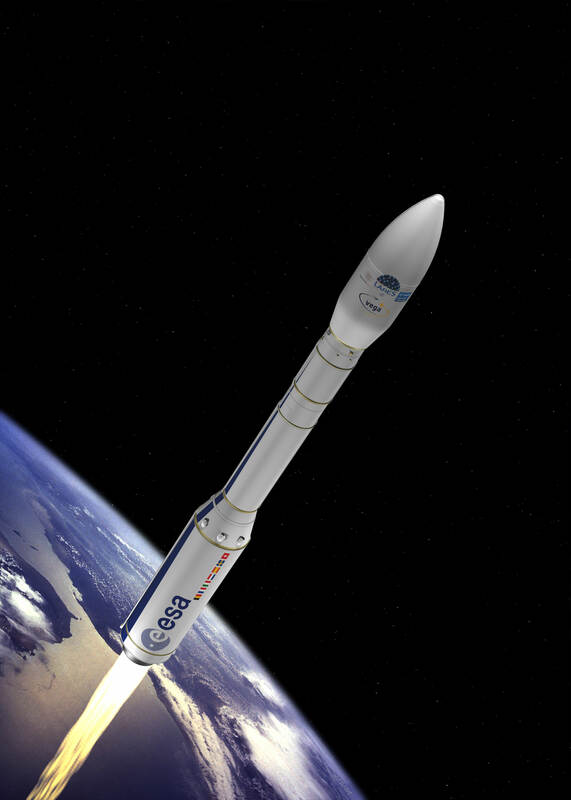 ESA has already signed commercial contracts for future Vega launches and 5 more Vega rockets are already in production. Vega’s light launch capacity accommodates a wide range of satellites – from 300 kg to 2500 kg – into a wide variety of orbits, from equatorial to Sun-synchronous. “Today is a moment of pride for Europe as well as those around 1000 individuals who have been involved in developing the world’s most modern and competitive launcher system for small satellites,” said Antonio Fabrizi, ESA’s Director of Launchers. ESA’s new Vega rocket fully assembled on its launch pad at Europe’s Spaceport in Kourou, French Guiana. Have you ever seen a space launch from orbit ? Check out the spectacular launch photo (above) of the Johannes Kepler ATV streaking skyward atop an Ariane 5 rocket as captured by astronaut Paolo Nespoli from his unparalleled vantage point looking out the windows aboard the International Space Station (ISS), in orbit some 350 km above Earth. The launch photo shows the rising exhaust trail from the rocket just minutes after blast off of the Ariane booster on Feb. 16 from the ESA rocket base in Kourou, French Guiana, South America. The rocket was still on a vertical ascent trajectory to orbit. Additional launch photos below from space and Earth. Photo captured on 16 February 2011 from the real-time video from the Ariane 5 launcher during the flight V200 during the time of jettisoning the boosters. The photo vividly illustrates the maturity of the European space effort since the launch base, Ariane booster rocket, Kepler payload and astronaut Nespoli all stem from Europe and are crucial to the future life of the ISS. Ariane 5 rocket at the Launch pad at Europe's Spaceport in Kourou, French Guiana with Johannes Kepler ATV bolted on top prior to Feb. 16 blast off. Kepler is set to dock at the ISS on Feb. 24 and an on time arrival is essential because of an impending orbital traffic jam. Space Shuttle Discovery is due to link up with the ISS just six hous after Kepler if the orbiter launches according to schedule on Feb. 22. Everything is nominal with Kepler’s spacecraft systems and orbital performance at this time say European Space Agency (ESA) officials, including the deployment of ATV’s four large solar wings. The ATV, or Automated Transfer Vehicle, is a European built resupply vessel designed to transport essential cargo and provisions to the ISS. It is Europe’s contribution to stocking up the ISS. Kepler is carrying carries more than seven metric tons of supplies and cargo for the ISS and will be used to reboost the outpost to a higher orbit during its planned four month mission. “ATV is a truly European spacecraft. Flying it requires experts from ESA, partner agencies and industry across half a dozen countries,” said ESA’s Bob Chesson, Head of the Human Spaceflight Operations Department. The ATV is named after Johannes Kepler (1571-1630), the German astronomer and mathematician who is best known for discovering the laws of planetary motion. NASA also named its powerful new planet hunting space telescope after Kepler, which recently discovered the first earth sized planets orbiting inside the habitable zone. After the shuttle is forcibly retired later this year in 2011, the very survival and continued use of the ISS will be completely dependent on a steady train of cargo and payloads lofted by unmanned resupply vessels including the ATV from Europe, HTV from Japan, Progress from Russia and commercial carriers such as SpaceX and Orbital Sciences. European Space Agency (ESA) astronaut Paolo Nespoli, Expedition 26 flight engineer, conducts a test run with the French/CNES neuroscientific research experiment 3D-Space (SAP) in the Columbus laboratory of the International Space Station. Here’s a chance to practice your French countdown skills: watch today’s successful launch of the European Space Agency’s Automated Transfer Vehicle “Johannes” on a Arianespace Ariane 5 rocket blasted off on Feb. 16, 2011, carrying the “Johannes Kepler” cargo-carrying vehicle to the International Space Station. It will take eight days for the ATV to arrive and dock to the aft end of the International Space Station’s Zvezda Service Module. This is the second of ESA’s resupply vehicles, and is loaded with about seven tons of supplies and propellant for use by the six crew members on the ISS. After yesterday’s scrub of Johannes Kepler, NASA had said that a launch of the ATV today (Wednesday) might delay the launch of space shuttle Discovery for STS-133. However, today, NASA said that might not be the case. Officials will decide Discovery’s launch date at the Flight Readiness Review on February 18. Currently, STS-133’s launch is scheduled for Feb. 24. The European Space Agency’s Automated Transfer Vehicle-2 (ATV-2) “Johannes Kepler” launch that was scheduled for Tuesday Feb. 15 was scrubbed due to a technical issue on the launch pad, and the slip could affect which day space shuttle Discovery launches for STS-133. Technicians at Launch Complex 3 in Kourou, French Guiana are looking at the problem, but preliminary details indicate some erroneous data on the status of the tank levels for fuel on the Ariane 5 rocket. They will go over the data carefully and if everything looks good they try again on Wednesday, Feb. 16. This launch slip could change the launch date for STS-133, which is now scheduled for Feb. 24. If the ATV does launch on Wednesday (or on Thursday or Friday of this week), the launch of STS-133 will move to Feb. 25. But if the ATV launch slips beyond Friday means that the STS-133 launch stays on Feb. 24. You can watch the launch attempt on Wednesday on NASA TV, and coverage will begin at 4:15 EST (21:15 GMT), with launch time at 4:50 pm EST (21:50 GMT). This is second launch of an ATV, and the 200th Ariane 5 launch. In the meantime, find out more about the building of the ATV in this great video from ESA. One final rocket launch in 2010 took place as Arianespace successfully launched the Hispasat 1E and KOREASAT 6 telecommunication satellites aboard an Ariane 5 ECA rocket from the Kourou spaceport in French Guiana. Liftoff was at 4:27 p.m. EST (21:27 GMT). KOREASAT 6 is a commercial telecommunications satellite of the KT Corporation of the Republic of Korea and was built by Orbital Sciences Corporation. Hispasat 1E is a telecommunications satellite designed to expand Hispasat’s coverage in Europe, the Americas, and North Africa. This is the sixth and final flight of the year for Arianespace’s heavy-lift rocket.